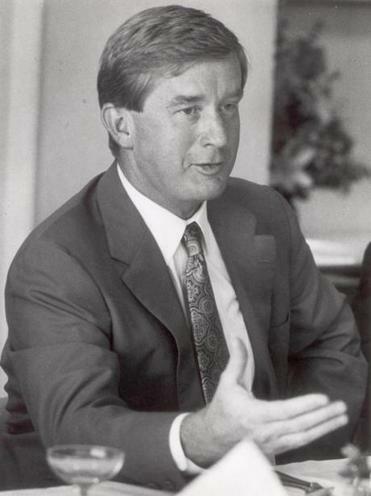 Former Massachusetts Governor William Weld in 1991. Until William F. Weld arrived at the State House as governor in 1991, it had been assumed for decades that state government had an important role to play in overseeing health care costs. When hospitals wanted to add more beds, for instance, or provide cardiac catheter services, they had to make their case to state regulators that such moves were in the public interest. At the same time, the state’s rate commission helped collect cost data from providers and establish the rates that hospitals could charge for procedures, within broad parameters. However, those efforts were deemed too radical by conservatives in state government. Weld and his secretary of health and human services, Charles D. Baker, are viewed today as moderate Republicans. But in fact they were devout libertarians when it came to issues regarding government regulation. Their mantra was not so different from the Tea Party backers of today — the less government, the better. In health care, the Weld administration essentially deregulated the system in 1992, based strictly on ideological grounds. Hospitals could charge what they wanted, passing on the costs to insurers — who, in turn, passed them on to employers and the economy as a whole. The results have been abysmal. Massachusetts health care costs are now 15 percent above the national average, and our individual market rates until recently were the highest in the nation. While costs have dropped since the recession began, this is a temporary respite stemming from lower utilization due in a bad economy. Most analysts anticipate another major cost escalation once the economy recovers. Clearly, the Commonwealth made a mistake under Weld. Luckily, there are models for returning to a system of common-sense regulation. One example of a system that works quite well is Maryland, which has regulated the rates hospitals are allowed to charge all payers — including Medicare — since the 1980s. In Maryland, the bill for the same procedure is always the same — whether it’s sent to Medicare, Medicaid, an insurance company, or to an individual patient paying with cash. Medicare subsidizes the Maryland demonstration to the tune of $500 million each year; in exchange, the federal government insists that Medicare costs in Maryland remain below the national average. While various studies of this approach have drawn murky conclusions, the fact is that in 1975 hospital costs in Maryland were 25 percent above the national average; by 2009, they were 2 percent below. One clear lesson from Maryland is that for any system to be truly effective, Medicare and Medicaid — not just private health insurance companies — must be included, since reimbursements from those programs generally represent about 50 percent of the revenue at most hospitals. To secure the participation of Medicare and Medicaid, Massachusetts should seek a federal waiver to permit a rate-regulation demonstration similar to the one in Maryland; the state can mandate private payer participation directly. Planning and regulation in our capitalist economy might be viewed as dangerous radicalism by the right wing these days, but we have seen the devastating consequences of deregulation policies in the private economy during the current meltdown and serious recession of the past four years. These policies were pursued by both Republicans and Democrats for two decades, while those economists who warned of major trouble ahead were either ignored or branded as hopelessly old-fashioned followers of New Deal liberalism. In health care in Massachusetts, it is hard to believe that these policies of deregulation begun under Weld have survived for 20 years in one of the most progressive states in the nation. Just as it took the current economic debacle to demonstrate the folly of bank deregulation, so it has taken the explosion of health care costs to expose the dangers of a deregulated health care sector. Secretary of Health and Human Services JudyAnn Bigby said the other day that “the buck has to stop somewhere.” As one who had her job for a long time, I agree with her sentiments completely. She argues for a new state agency, reporting directly to her, which would be responsible for implementing new regulations to control health care costs. She and I both learned the most important lesson of managing a large bureaucracy — make sure that one single person or agency is responsible and accountable to the secretary and the governor for handling a specific problem. If the lines of authority are confused, failure is sure to follow. This new agency should involve itself in making sure that community-based health care, including our safety net hospitals and our terrific network of community health centers, prosper and thrive and are not crushed by the big, wealthy providers which increasingly dominate our state’s health delivery system. The good news is that we have a governor and legislative leaders — joined by activist business executives and health advocates — who insist that the days of double-digit cost increases are over. They take the reasonable position that moderate regulation will pay big dividends for most consumers and most providers. Significant differences exist between the Senate and House versions of the payment reform legislation, which need to be ironed out over the next few weeks. But whatever the final bill looks like, the important reality will be that state government will be a major player in health policy in our state. Philip W. Johnston was the Massachusetts secretary of human services from 1984-1991 and is now the CEO of health care consulting firm.